Figure 1. WBC feeding damage on SmartStax hybrid, Bothwell, ON. Sept 6, 2013. Photo credit: Jocelyn Smith, University of Guelph Ridgetown Campus. It appears that in 2013, southwestern Ontario’s hotspot areas for Western bean cutworm (WBC) (large area around Bothwell and Tilsonburg) have a significant problem in their corn fields. 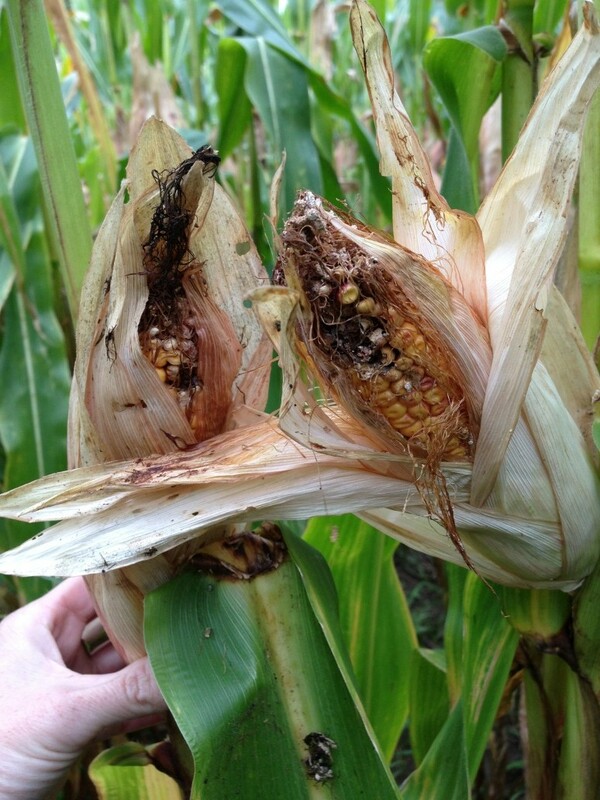 OMAF and MRA and University of Guelph Ridgetown Campus staff have completed surveys of fields in these risk areas (coarse textured soils where WBC overwintering is expected to be most successful), and have found much worse infestations than in 2012. Fields were scouted for egg masses in mid to late July and where egg mass incidence ranged from 1-11%, we are now finding 3-50 larvae feeding per 100 ears causing 3-9% ear damage. These heavy populations are challenging the effectiveness of some Bt hybrids and significant damage is being found on SmartStax and Herculex hybrids. 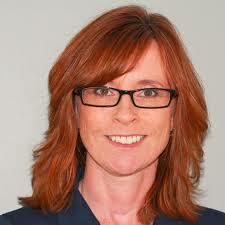 Not all Bt-corn hybrids control WBC. The Agrisure Viptera trait from Syngenta is the most effective Bt-corn trait for WBC control; we see virtually no survival of WBC on Viptera corn tissue. On the other end of the spectrum, the Bt traits in the Genuity Double and Triple Pro hybrids have almost no effect on WBC larvae, so these hybrids planted in the WBC risk areas are the ones that need protection in the summer with a foliar insecticide if the threshold is reached during early tassel stages. Figure 2. WBC larvae feeding on SmartStax hybrid, Bothwell, ON. Sept 6, 2013. Photo credit: Jocelyn Smith, University of Guelph Ridgetown Campus. Somewhere in between these two extremes lies the Cry 1F Bt that is present in SmartStax, Herculex, and Optimum AcreMax hybrids. This trait does have activity against WBC; however, in the hotspot areas with heavy infestations in 2013, we are not seeing significant differences in WBC infestation levels between Cry 1F and non-Bt hybrids (Figure 1). Yields have yet to be measured, but with the feeding damage taking place, the potential for ear molds and mycotoxins is seriously concerning (Figure 2). The lack of control of these Bt hybrids under heavy WBC pressure raises further research questions about resistance development and whether thresholds need to be set for Cry 1F hybrids. We don’t exactly know why the population was so successful this year but there are a few differences between the 2012 and 2013 seasons that we could speculate may be contributing factors. The early planting dates we were able to achieve in 2012 likely allowed the preferred pre-tassel stage for WBC egg laying to happen before the majority of moths were present. 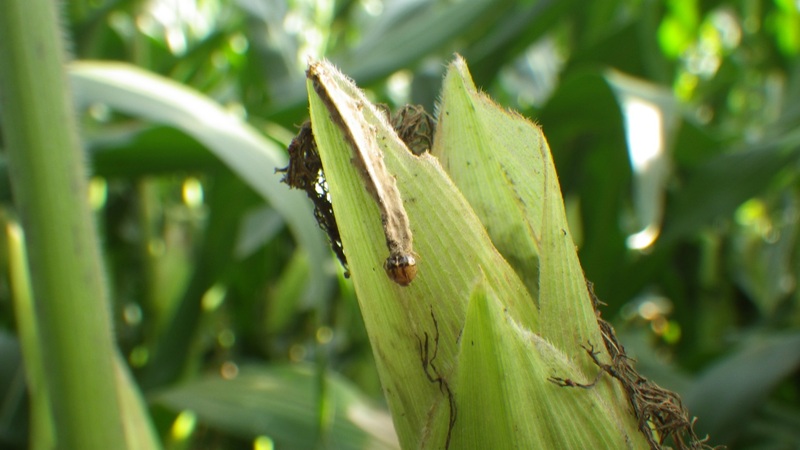 In 2013, late planted and re-planted corn in the WBC hotspot areas was at the perfect stage for WBC egg laying so that newly hatched larvae had ample tassel and pollen tissue to feed on. Temperatures during the egg laying and egg hatch period in 2013 were not as high as in 2012, which may have been advantageous for survival of early instar larvae. It’s also possible that the 2012/2013 overwintering conditions were more favourable for WBC than they were in 2011/2012. 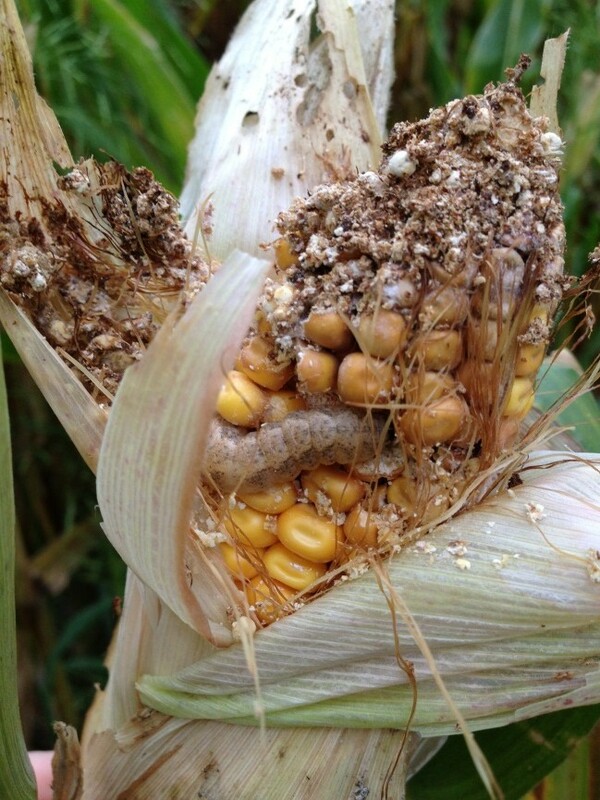 We saw high levels of WBC egg parasitism in 2012 and this did not seem to be as noticeable in 2013, however, we have observed a lot of mortality in heavily infested fields due to pathogens which has not been noticed at such levels before this year (Figure 3). This is good news as biological control of WBC, but may be more prevalent this year in response to such high host populations. Figure 4. 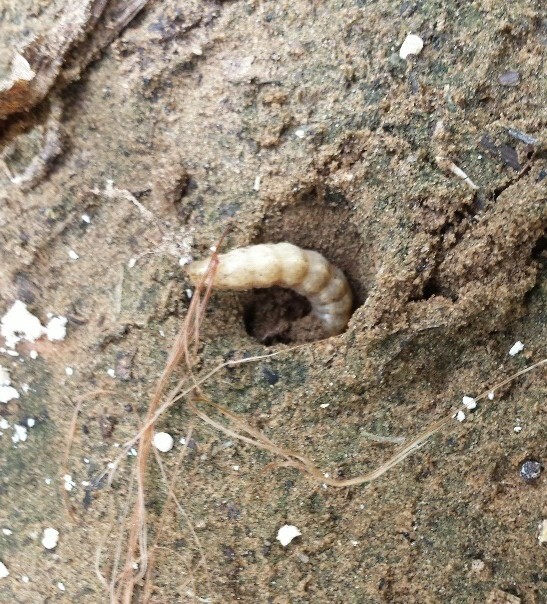 Sixth instar WBC larvae burrowing into soil, Bothwell, ON. Sept. 12, 2013. Photo credit: Jen Bruggeman, University of Guelph Ridgetown Campus.